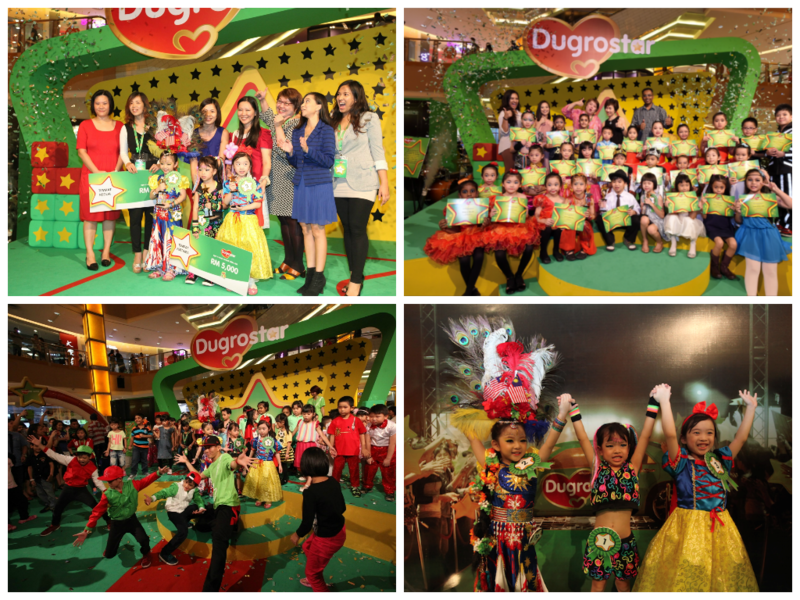 Recently, from 31 October to 2 November, Dugro hosted a roadshow and the Dugrostar finale at Sunway Pyramid. The event, which was Malaysia's biggest tribute to children's talents, showcased extremely adorable performances by the young finalists. Check them out! Top left: (2nd row far left) Connie Ang, Managing Director of Danone Dumex Malaysia and (2nd row from right) expert judges - Nur Diyana Hashim, Radio DJ and Instructor at BluBricks; Elza Irdalynna, Actor, Producer, and Speech/Drama Instructor at Blubricks; and Ruth Liew, Director of Malaysian Child Resource Institute and Child Developmentalist; (3 winners in front row left - right); 2nd Place: Vincy Kong Yun Sim, 5 years old, singing; 1st Place: Ashley Yong Hui Jing, 4 years old, dancing; 3rd Place: Cindy Lim, 5 years old, piano. Top right: (featuring the 7-10 year-olds): (Seated in front, from left to right) - 2nd Place winner: Alexandria Ng Shu Lynn, 6 years old, dancing; 1st Place winner: Darius Leong Por Loon, 9 years old, dancing; and 3rd Place winner: Erika Foo Hann-Yi, 8 years old, singing and keyboard with other finalists, judges, and Danone Dumex representatives. Dugrostar™,the first performing arts platform organized by Dugro®, is hosting a series of final live performances that showcase the exceptional talents of children across Malaysia. As many as 6,381 children came forth to show their potential and creativity in a combination of singing, dancing, and playing of musical instruments since the launch of the Dugrostar™ campaign in August. Created to inspire children to discover their fullest potential, Dugrostar™ is Malaysia’s biggest celebration of talent among the young, culminating in seven finales being held across seven states, and rewarding a total of 280 children with over RM175,000 in cash prizes throughout the country. At the Klang Valley finale held in Sunway Pyramid, 40 were crowned stars for their enthusiasm, energy and sheer talent displayed during their performance, which stole the hearts of the crowd as well as the judges. *Kindly refer to attached list of 40 finalists.For every location, the top three prize winners walk away with RM5,000, RM3,000, and RM1,000 cash prizes plus trophies, respectively, while the other finalists receive consolation prizes. The Dugrostar™ finales also spotlight interesting children’s performances and promotions as well as stage and booth activities to engage visiting families such as the Dugrostar™ Step, Dugrostar™ Beat, Dugrostar™ Style and family photo-taking activities. At the same time, the Dugrostar™ Studio video booth allowsthose who did not register in time, to still perform and be part of the Dugrostar™ campaign, with the opportunity to win other attractive prizes! TheDugrostar™ judging panel and campaign advisors was made up of child experts such as Ms Ruth Liew, Director of Malaysian Child Resource Institute and Child Developmentalist; Mr Zaid Mohamad, Columnist, Best-Selling Author, Parental Coach; Ms Elaine Yong, Developmental Psychologist and Lecturer at the Department of Psychology at Sunway University;and performing arts professionals from Blubricks, a leading speech and drama centre led by Mr Az’farr Baginda, Theatre Practitioner, Educator, and Principal of Blubricks. Dugro® is a growing up formula brand. Its latest innovation, Dugro® with 5Nutri, helps support overall multi-dimensional growth in children which include five key growth areas: mind, bone, immunity, digestion and vitality. For more information on Dugro® and Dugrostar™, log on to www.dugro.com.my or call the DumexCareLine at 1-800-38-1038.